Here are the answers to the questions we are most frequently asked. How long can I expect my fence to last? What wood should I choose, cedar or spruce? How will temperature extremes affect my vinyl fence? Do I need to know building codes and town regulations? What is the safest fence for my pool? I've always had a problem with my gates, can this be prevented? Should my wood fence be stained? How do I maintain my vinyl fence? Two factors are very important. The first is the type of material used. For a wood fence, using cedar has lasted for over 30 years. However the norm is 15 to 18 years. Metal and vinyl last indefinitely. The second and equally important factor is the method of installation. Having your fence installed by a trained professional will ensure maximum strength and durability. You should keep in mind how long the fence will last. Cedar, because of its durability, will actually cost you less in the long run. 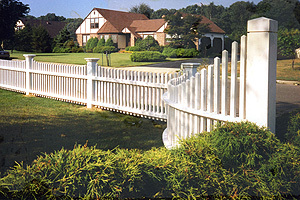 Purchasing the correct type of vinyl fence is the key. Your fence should be virgin vinyl with UV protection. This has been tested for both weather and time. Do I need to know building my codes and town regulations? Yes, each town has its own codes specifying fence height and location. Our trained staff can help you with the pool and fence codes for your own town. What is the safest fence to put around my pool? You must first check with your town or village for its codes. The safest fence is the one that is the most difficult to climb. Aluminum estate fence usually provides the best combination of beauty and safety. Our staff is always available to answer any questions you might have. I've always had a problem with my gates; can this be prevented? The most common problem with gates is poor installation of the gate post. Proper length and strength of the gate post with proper clearance will provide problem-free operation for years. Our staff can assist you in choosing the proper size, weight and method of installation. Although a cedar fence will last unfinished for years, staining will help keep moisture off the surface. This will extend the life of your fence. If dirt adheres to your fence, it is best to use gentle washing with a mild detergent. Using any abrasive cleaner can damage the surface of your fence!